Wirgin cameras are top quality, full features submini cameras. But they are harder to find. The Wirgin 16mm cameras were designed to use the same cassette as the earlier Goldammer camera. This cassette was later used in Rollei 16mm cameras. They use one RADA cassette, loaded with film and use a special film take-up reel. This is an open reel, much like a larger version of a Hit film spool. 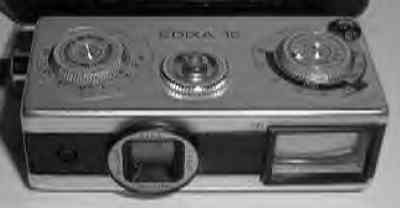 (1960) Similar to the Edixa 16 with a 25mm (f2.8) lens. Film format of 12x17mm. (1960) Sporting a Schneider 25mm (f2.8-16) lens, this model started a series of Germany subminis using the RADA film cassette. Since it used the RADA-style cassette it had a rewind crank. It was well-designed and quite small. The lens focused from 15 inches to infinity. Film format of 12x17mm. Shutter speeds of 1/30 - 1/150. Built-in UV filter. Accessories included a clip-on selenium exposure meter, push-on filters, flash gun, neck chain projector, and slide mounts. (1962) Similar to the Edixa 16. (1965) Similar to the Edixa 16. (1963) Black version of the Edixa M.
Similar to the 16 S but with a Ulm-Donau Travegar Schacht 25mm f2.8 (to f16) lens. Close focusing to 16 inches. Shutter speeds coupled to the apertures. Designed to work with the coupled EV meter. Just dial in the EV number to the "shutter speed" dial. A rare variant of the Edixa 16.